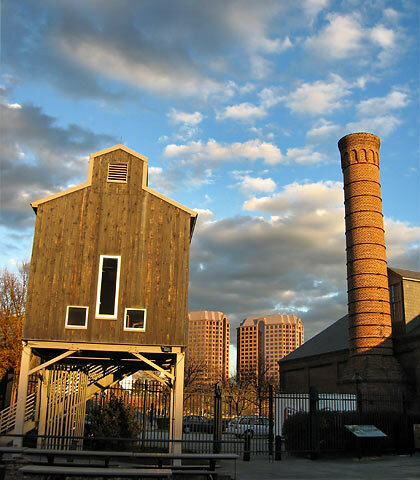 The area between and around Richmond, Virginia and Washington D.C. is rich in historical sites, among them several American Civil War battlefield parks and other historical places of interest that go all the way back to the American Revolution. It was a place familiar to Leo, at least from reading history books. He finally got to see them in person when we came to Virginia a few years back. A Civil War field gun bears mute testimony to the bloody stalemate that was Petersburg. Given Leo’s love of history it was a foregone conclusion that we would at least see one of these sites. When we visited Emilyn, a friend near Richmond, we found out that her husband Scott had a similar interest; they offered to take us around some of the old Civil War battlefields closest to their place. 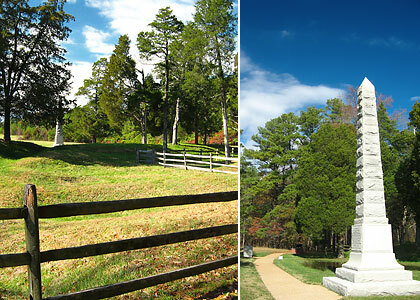 Left: part of the Crater (now partially filled-in) - the site of a bloody Federal reverse in the siege of Petersburg; Right: a monument to a Civil War unit. 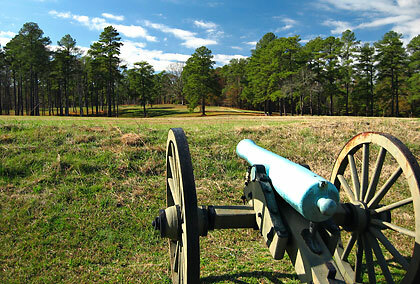 First on the itinerary was Petersburg National Battlefield Park located more than 20 miles south of Richmond. Petersburg was the site of a bloody 10-month siege that ended with the capture of Richmond, the capital of the Confederacy, by Union forces in 1865. Before the siege ended however, the fighting evolved into a long stalemate costing tens of thousands of casualties as the Federals sought to break through the Confederate fortifications. Probably the most famous event (dramatized in the movie “Cold Mountain”) was the Battle of the Crater, an ingenious attempt by the Union IX Corps to break through Confederate lines by digging a tunnel under Confederate trenches and loading it with four tons of mines. Despite the brilliant plan and execution by Pennsylvanian troops who had been miners before the war, the follow-through attack was badly mismanaged. The huge crater formed by the mine explosion was turned into a slaughter pen as trapped Union soldiers inside were mowed down by Confederate infantry rushed to the scene to stem the Union attack. A forest now covers ground previously scarred by trenches and shell craters. The now partially filled Crater and even part of the tunnel are still there – a mute testimony to the savagery of a war between fellow Americans. What was once an area pockmarked by trenches and shell craters is now a quiet and verdantly beautiful place with occasional reminders of the bloodletting almost 150 years ago. The rusting cannons, old wooden fortifications and other implements of war made sure no one would forget. A visitor center provides information on the battle through exhibits of weapons and other artifacts, photographs, graphics and videos. 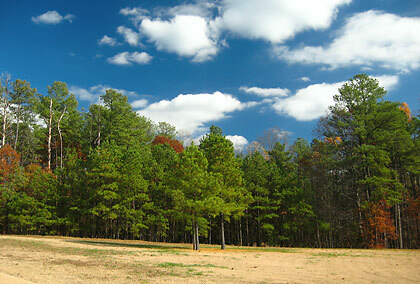 From the Petersburg Battlefield we moved on towards Richmond  the capital of the Confederacy during the Civil War. The Tredegar Ironworks in the heart of the city was used to supply the Confederates with artillery and ammunition and continued to be used to manufacture weapons during the two World Wars. One of its original buildings now serves as a visitor center at the Richmond National Battlefield Park, containing a self-guided museum and several exhibits of weapons used during the war. The site sits amidst modern high-rise buildings and highway overpasses, but beckons to an era that had a profound effect on the nation. The battlefield park itself is quite extensive, consisting of 13 separate sites including the locations for such Civil War battles as Cold Harbor, Gaines Mill, Malvern Hill and other battlefields of the 1862 Peninsular Campaign. 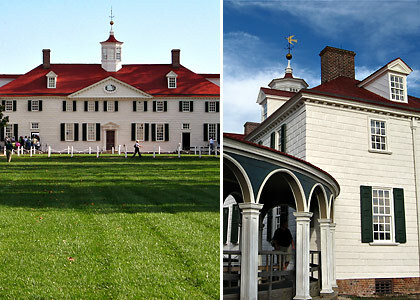 The first American president, George Washington lived here: Mount Vernon, Virginia. Washington’s mansion is situated overlooking the Potomac River. The mansion offers a glimpse into Washington’s family life and into 18th century America and includes restored period furniture on display throughout the 14 rooms of the mansion. 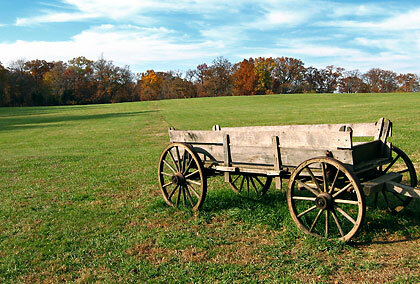 There is also a blacksmith shop, a demonstration farm with a reconstructed slave cabin and a treading barn. 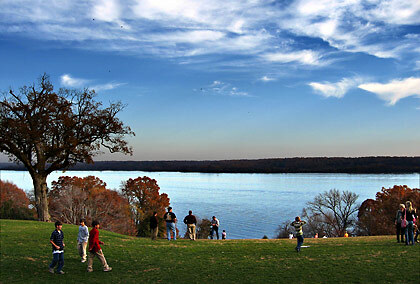 The estate overlooks the Potomac River. Strolling around the back of the mansion, we got to view this historic river as it snakes around a bend on its way towards the nation’s capital. Washington must have spent a good deal of time strolling around the Potomac’s banks in periods of quiet reflection. Our trip across historic Virginia evoked memories of two important events in the history of America that would have far-reaching effects on the history of the nation. The guns of the American Revolution and the Civil War are silent now but their memory and that of the sacrifices of the men and women involved are preserved for posterity in these historical sites.